The Collins family were established in Yeovil certainly from the middle of the eighteenth century. Although the father's name is unknown to us, the matriarch's name was Mary and she had at least five children; Elizabeth, Henry (1752-1827), Philip (d1790), Mary and William. Little is known of Elizabeth; from her brother Philip's will she married a Mr Woolmington and had a daughter Sarah to whom Philip bequeathed twenty pounds (worth about £40,000 at today's value). Another daughter, Mary, married Giles Hodges. Similarly, Philip's will makes the only mention of his brother William to whom he left his grey mare with the request that "he never dispose of or part with her on any Account whatever." Philip Collins, who died in 1790, was a Yeovil butcher with substantial wealth and left most of his estate to his wife Martha. However it would appear that Philip and Martha had no surviving children since he left, on the death or remarriage of his wife, ".... the Messuage or dwellinghouse within which I now live with the Outhouses coach house and Garden" to his nephew Philip and he left a "close called Furze Hedge lying near Brick Yard Lane" (today's St Michael's Avenue) to his nephew Henry - Philip and Henry being the sons of his brother Henry. Henry Collins was born in Yeovil in 1752 and married Elizabeth Winter. Henry and Elizabeth were to have seven children; Martha (1777- pre 1835), Mary (d post 1835), Susanna 1783-1840). Henry Jnr (1787-1841), Philip (1788-1835), Sarah (1790-1840) and Elizabeth (1793-1868). In 1784 Henry, 'Glover of Yeovil', was listed in the UK register of duties paid for apprentices' indentures when he took on as an apprentice William Thring. This same year Henry Collins was listed in Bailey's British Directory as a manufacturer of fine leather gloves. He was noted as a glove manufacturer in deeds of both 1786 and 1787 as well as in a 'Survey of the County of Somerset' of 1789. He was listed as a 'Glover, Lamb & Kid Leather Dresser' in the Universal British directory of 1790. His glove factory was in Court Ash and he and his family lived in Court Ash House. From 1804 until 1807 Henry served as a Churchwarden of St John's church. In 1818, together co-former Churchwardens George Watts and William Willmington (Henry Collins' son-in-law), Henry gave evidence before the Select Committee of the House of Commons as to his role in the Yeovil Charities Scandal. Henry Collins lived in the large nine-bedroom residence Court Ash House shown on the map below. Next to it, to the north of the sheep pens, was his glove factory. Both the house and glove factory were later occupied by his sons, glove manufacturers Henry and Philip, then by his son-in-law glove manufacturer William Willmington and his son Edwin Willmington in the early 1850s and by glove manufacturer Elias Lyndall Whitby from the mid-1860s. Henry Collins, accorded the rank of Gentleman, died on 11 January 1827, aged 75, and Elizabeth died on 18 January 1821, aged 67. They are buried in a vault in the centre aisle of St John's church together with their two sons, Henry and Philip. Martha married glove manufacturer William Willmington in 1795. Together they would have nine children; William Edward (b1798), Mary (b1800), Elizabeth (b1802), Henry (b1804), Amelia Collins (b1806), Emma Matilda Collins (b1808), Sophia Collins (b1810), Philip Collins (b1812), Edwin Collins (b1815) and Mary Ann Collins (b1817). Martha died before 1835. Nothing is known of Mary, other than she died after 1835. Similarly only Elizabeth's year of birth (1783) and death (1840) are known. In 1824 the company of Henry & Philip Collins, glove manufacturers of Court Ash, were listed in Pigot's Directory of that year. Henry and Philip were the sons of Henry Snr. and clearly took over their father's business on his retirement. Neither this company nor either of the Collins boys as an individual glove manufacturers were listed in any trade directories after this date. Henry Jnr, born in 1786 and baptised at St John's church on 28 September, the older brother by a year, married Mary Ann Merewether in St Michael's church, Mere, Wiltshire on 29 February 1808. She was the youngest daughter of John Merewether (1753-1828), Gentleman, of Mere Park, Wiltshire. It is not known if Henry and Mary had children but she died in 1814. A sketch map by E Watts, dated 1829, recorded Court Ash House as "Mr Collins' Premises". Henry Collins (Jnr) was listed in the Yeovil poll books of both 1832 and 1834 as living in Court Ash and was in the poll books by virtue of owning freehold land at "Brittol's Hill, etc." in Yeovil. He was also a member of the Vestry. Henry Jnr died on 11 September 1841, aged 54. His brother Philip was listed in both poll books by virtue of owning freehold land in Brickyard Lane - this was the field called Furze Hedge that Philip had inherited from his uncle Philip. Henry Collins Jnr's signature against the Vestry minutes of 3 March 1831. 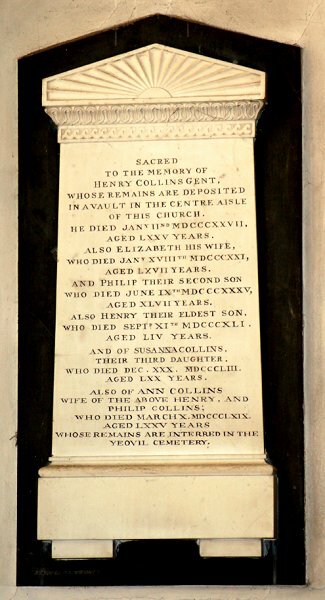 On the Collins' monument in St John's church, illustrated below, it reads somewhat ambiguously "Also of Ann Collins wife of the above Henry, and Philip Collins; who died 10 March 1869 aged 75 years." Since Henry's wife Mary Ann née Merewether died in 1814 it is likely that Henry remarried. Perhaps somewhat more perplexing is the inference that Ann was also married to Philip (?). Certainly Philip's wife was named Ann in his will of 1827 so perhaps after Philip's death in 1835 his widow Ann married widower Henry. In any event in the 1846 Tithe Apportionment Ann Collins was listed as the owner of several houses, parcels of land, etc. including being the owner and occupier of 'House, Garden & Orchard' (Parcel 50) - which was Court Ash House. Ann Collins' land holdings, inherited via her husband, are tabulated below. It appears that Philip and Ann (possibly the Miss Hayward of Mudford who married Mr Philip Collins of Yeovil in 1810) did not have children since in the event of her death or remarriage Philip left everything to the care of his brother Henry, which included lands in both Mudford and Marston Magna, apart from a thousand pounds (in excess of £1.3 million at today's value) left to his sister Elizabeth. He also stipulated that after the death or remarriage of his wife, his estate be divided "unto my three sisters Mary, Sarah and Elizabeth. There is no mention of his sister Susanna. Philip Collins died on 9 June 1835 aged 57. The Bristol Mercury reported "Philip Collins, Esq. of Court Ash, Yeovil. He had been unwell for some time past, and while taking air in the garden, he suddenly fell down in a fit of apoplexy and expired." Sarah Collins married Edward Merewether, Gentleman, of Mere Park, Wiltshire, in 1820. It appears that Edward was already Sarah's brother-in-law as his older sister Mary Ann had married Sarah's brother Henry in 1808. Sarah died in 1840, aged 50. Finally, Henry and Elizabeth's youngest daughter, Elizabeth, married Yeovil glove manufacturer Samuel Duffett in 1821. They were to have six children; Anna (b1826), Henry (bc1827), Emily (b1828), Louisa (b1830), Matilda (b1832) and Flora (b1835). The family lived next door but one to the Pall Tavern in Silver Street. Elizabeth died in Yeovil in 1868 aged 75. 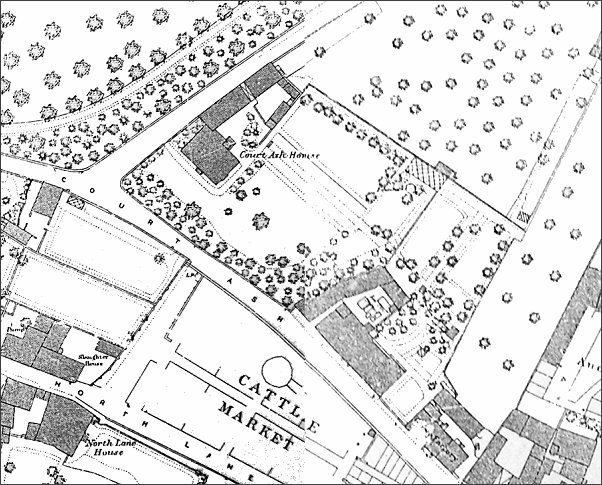 This map, based on the 1886 Ordnance Survey, shows Henry Collins' large residence, Court Ash House at top centre left. Next to it, to the north of the sheep pens, is his glove factory. The site of the house is now the Odeon cinema and factory site is today built up with offices. Below are the holdings of Ann Collins as recorded in the 1846 Tithe Apportionment. Parcel 50 is Court Ash House and its orchard, in total measuring 1a 2r 9p and it is, perhaps, surprising to see Frogg Mill amongst her holdings. Much of the rest were in the Bucklers Mead area. The total acreage owned by Ann Collins in 1846 amounted to 43a 0r 32p (for details on historic land measurement - ie acres, roods and perches - click here). 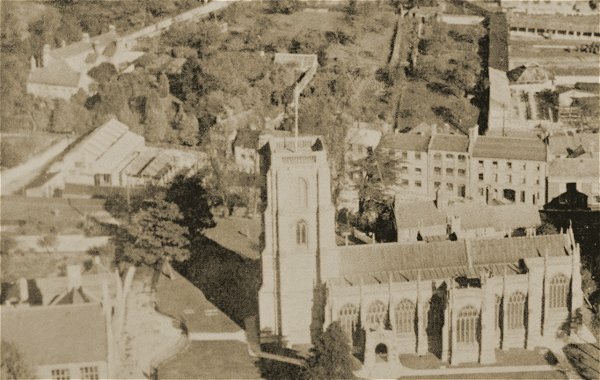 An aerial view of St John's church taken in 1924. 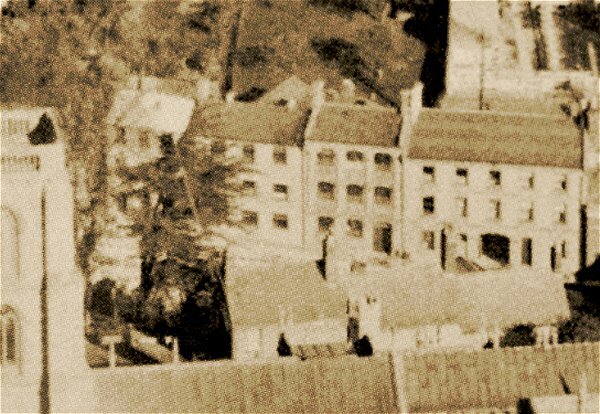 At top left is Court Ash House set within its extensive grounds (now the site of the Odeon cinema building) and directly above the church roof are seen Henry Collins' glove factory buildings, enlarged in the photograph below. An enlargement of the previous photographs showing Henry Collins' glove factory complex at centre and centre left. At right Nos 1 & 2 Court Ash, not part of Collins' complex, remains today. The Collins' memorial in St John's church.